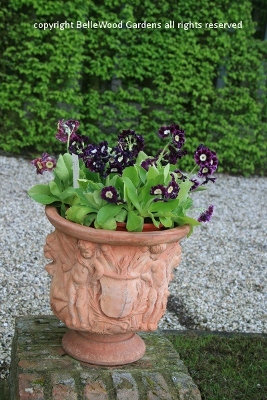 Of course, what would a garden be without plants. 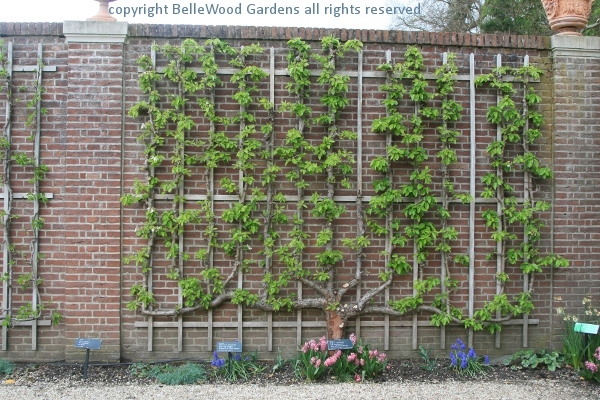 Not merely the green landscape of hedges and parterres, yews clipped into topiary pyramids, the berceau, and greensward. No, by plants I referring flowering plants. 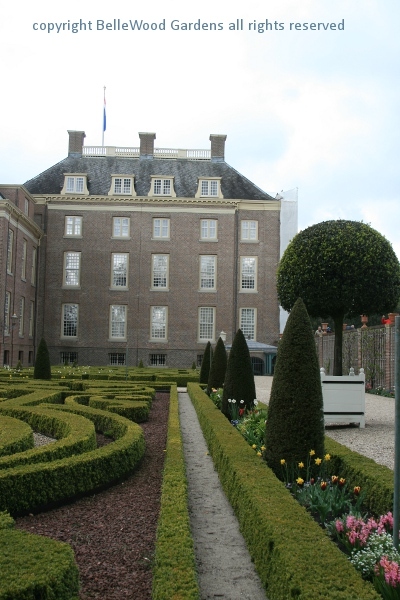 In the days of Stadtholder, the later King Willem and Mary, his Queen, flowers were secondary to the geometry of the garden. Visions of paradise, but a paradise clipped, tweaked, orderly, and well maintained. 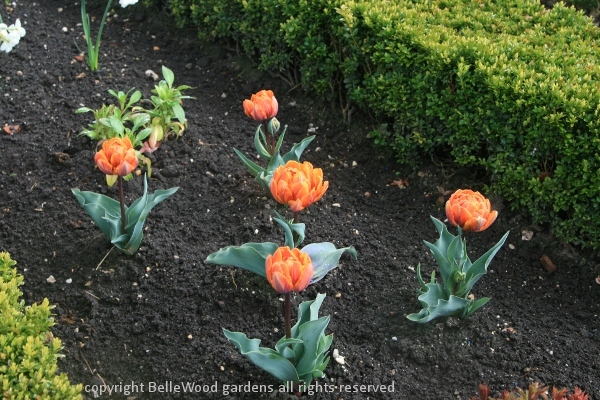 the flowering / fruiting of more tender fruit trees such as peaches and apricots. Attractive, too. 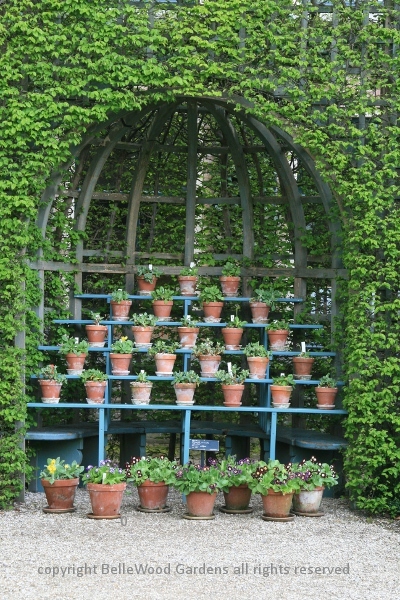 Another fancy was the competitive showing of potted plants. 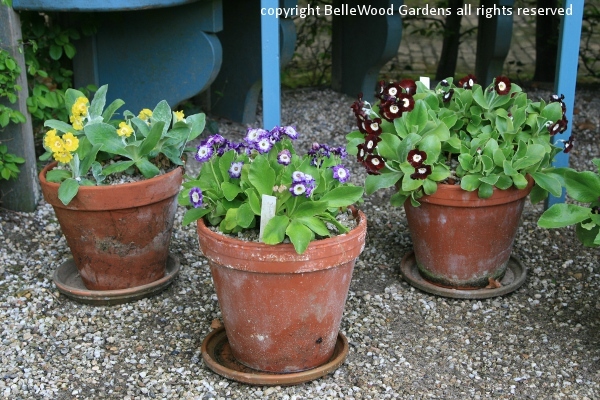 In the berceau I found a niche with pots of Primula auricula. removing the powdery white farina from their leaves, part of this species appeal. 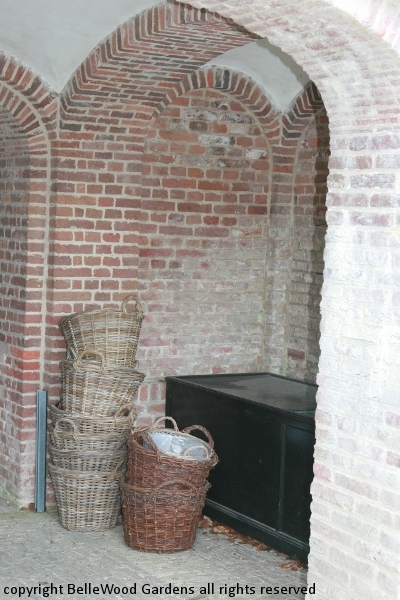 A garden such as this needs thorough attention to the details, the minutia of maintenance. I spoke to one young man who was here as a temporary gardener during his school break. 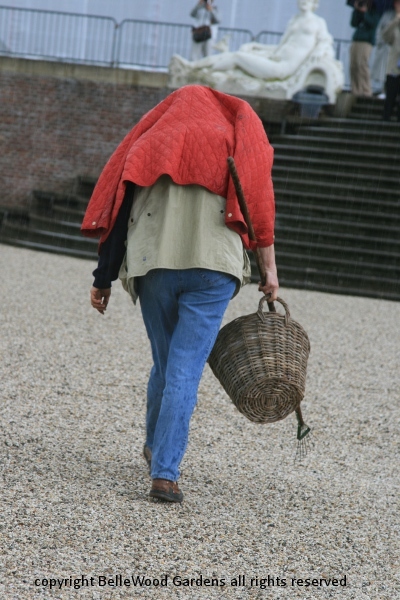 But the somewhat damp gardener seen below told me that Palais Het Loo has 90 full time gardeners, each of whom has a section of the parterres. And a weekly rotation to keep them at the peak of perfection. 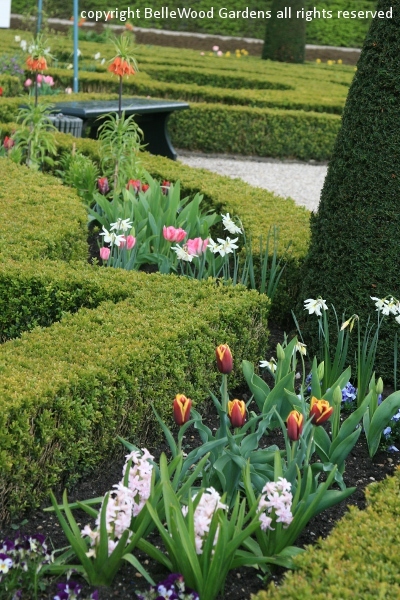 The parterre beds are bordered by plates-bandes, narrow "closed"
is to simplify the removal of trimmings when the hedges are clipped. 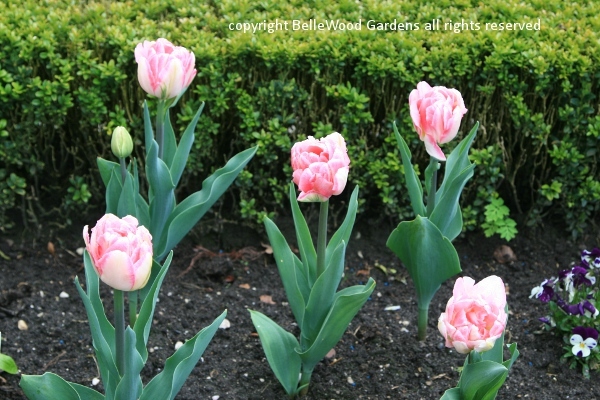 Double pink tulips in groups of five, ditto for 'Orange Princess'. Why five? I don't know but what our attention is sharpened, focused on these few than with a painterly sweep. 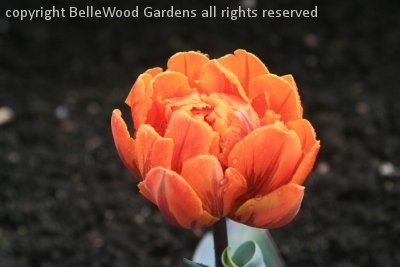 A closer look at Tulipa 'Orange Princess'. 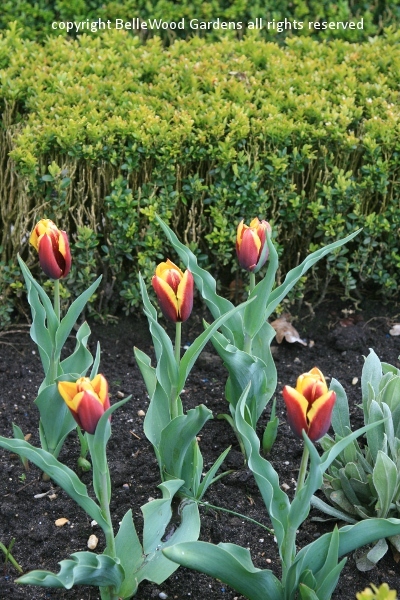 Crisp red tulips with an edging of yellow to each petal. 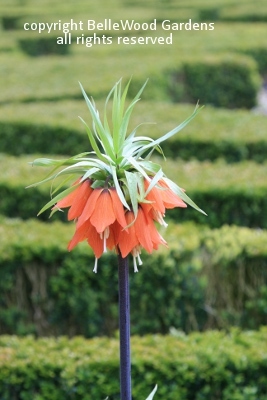 and stately crown imperial, one by one, as accents for the presentation. Tour Comments:Despite the drizzle I'm so glad we had a morning here.